So the past two months have been a bit of a hectic time for me, with work, planning this amazing blogging event in December and everything else life throws at me. The best thing that's happened to me these past few months however, has got to be the fact that now... I'm ENGAGED!!!! Okay, it wasn't a surprise, but it's still super exciting! I'd known for two weeks that he was going to propose, as I'm a bit of a perfectionist and my soon to be hubby wanted me to pick my own ring as I'm the 'one who has to wear it for the rest of my life'. But he did have some hand in the choosing.. just wait! So when it did, he sat me down, and said 'I want to buy you a ring' (don't worry, this isn't the proposal!). I couldn't help but grin from ear to ear. I knew he was going to eventually, I was just waiting and waiting in anticipation for the last year or so for when he felt he was ready. We're now in our second flat together and are finally settling in with expensive furniture to replace cheap crap we bought for our first flat and generally, investing in our future life together, so what better a time to be 'ready'! 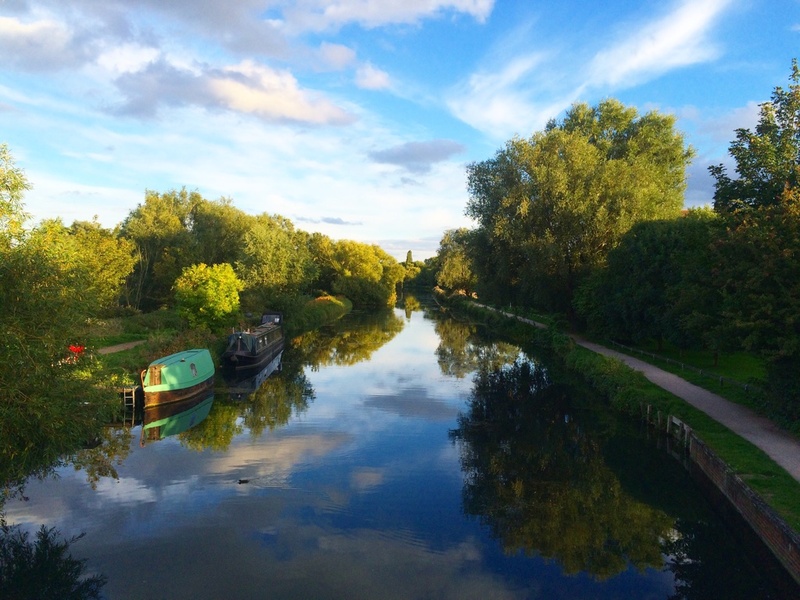 After a lovely Sunday roast cooked by moi, we went for a walk down the canal. I knew this was it!!! After about half an hour of strolling and exploring, I turned around after taking a nice picture and he was down on one knee. It was so CUTE! It happened. It was adorable. I couldn't wait to tell everyone! I have a jeweller that I go to every time I need something fixed and I can't help but browse the ring selection in the hope that I'd wear one someday. I've been with S now for over 4 years and he's accompanied me to the jeweller on many occasions. As girls do.. I've hinted many times which ring was my favourite in the hope that he'd remember for when the day did actually come. Even though, deep down I knew and he knew what ring I wanted, I still wanted to spend some time looking at various options and doing some research into diamond clarity etc. We chose the weekend after he brought it up and proposed the weekend after that. I will let you in on what I found out, before I let you in on the reason I settled on this beauty. I don't claim to be an expert (I may even be horrendously wrong on something I'm sure!) this is just what I know to be true. If you really want to know more about this sort of stuff, go to a jewellers! They'll tell you everything you need to know! Diamonds are rated with 4 C's - Clarity, Cut, Colour and Carat. Whether its a Halo, Cluster, Trilogy or Solitaire style, Pavé, Channel, Bar or Flush set, choosing a ring can be quite daunting when you first start looking. The Colour scale is from White to Yellow. Both ends of the spectrum are quite rare, therefore completely colourless and pure yellow would be very expensive. If your budget is between £300 and £500, you can look between I and K and still maintain a good clarity and carat. If your budget reaches to around £1000, you could probably find one as high as G if you're lucky. There is no point however trying to aim for the best of the best in all categories. You cannot look at one without the other but sometimes you have to make compromises as you can't have it all (unless you have BIG $$$$$). Carat isn't always the size of the diamond, but the weight. Some rings, particularly clusters, halos and trilogies, carat is given as a collective weight as each stone is so small. 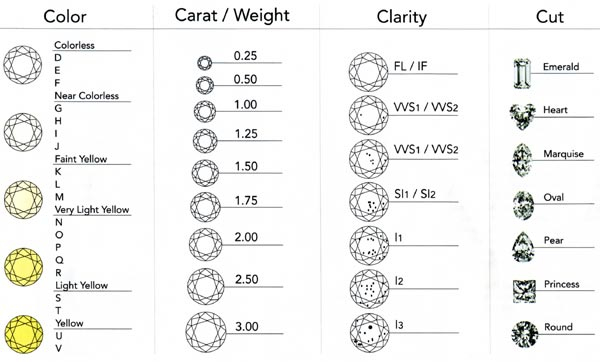 Also, depending on how its cut and how its set, the carat can vary so much. Clarity is how 'perfect' the stone is. There are tiny imperfections in stones which can be visible to the eye. These are rated I3- SI2. From SI1 (Slightly Included) to VS1 ( Very Slightly Included) you would need one of those magnifying things to see them and then VS2 through VVS to FL (flawless) are the rarest and most expensive and would need to be looked at under at least a 10x magnification to check for any imperfections. As my ring is a Halo, the diamonds are relatively small so that the centre stone stands out. Collectively, I believe the collective carat is between 0.75 and 1 carat with G/H colour and SI1 clarity. Set in a slim 18 karat (different type than stones) white gold band. It's gorge! If the carat is low, you can probably get away with having a low clarity as you wouldn't be able to see it. 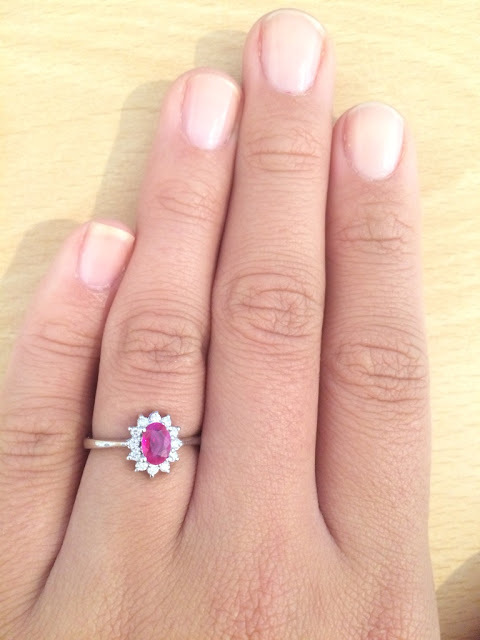 And the higher the carat, the more noticeable the colour. But truthfully, none of this really matters. That is what I came to realise after trawling the internet to find the 'perfect' ring that 'ticked' all the boxes. Realistically you're not going to find one that meets your high standards that actually looks and feels deep down like the ring of your dreams! You should choose the one that really feels right. The one that your heart calls to. The one I settled on was really the one I wanted all along. I think I only looked at others for peace of mind that I was choosing it for the right reasons. The decision ended up being between my ring and a simple trilogy. They were both gorgeous! Secretly, I knew the trilogy was the checkbox choice but I would always look at it and know that. The Ruby and Diamond ring however, it meant more than mere value for money or being the clearest, colourless most perfect cut within my budget. Diamond is my birthstone (April) and Ruby is his (July) so, this ring really spoke to me and represented our relationship. In the end I left it to S to choose between them and I think he too knew deep down it was the perfect ring for me. Plus, if I ever wanted to, the centre stone could be changed out for a Diamond. But I love it. it's perfect, its different and it's meaningful. And that's exactly what an engagement ring should be! Choose with your heart. Not your head! Have you gotten engaged recently? What ring did you/your other half choose? Let me know in the comments!